Today our Room Parents arrived with gifts for the teachers, from all the families in our class. Children were excited to watch their teachers tear open paper and uncover a gift. Rarely am I at a loss for words. I was when I opened the gift. It was a book, Our Aqua Room Family. Family. That word somehow becomes cemented in September. It is much like a badge, something everyone wears, feels and just knows. We’re a family. Our hair is curled, our eyes are blue, Our skins are different colors, too. We’re young and old, we’re short and tall. And still we are a family. We help each other ever day. 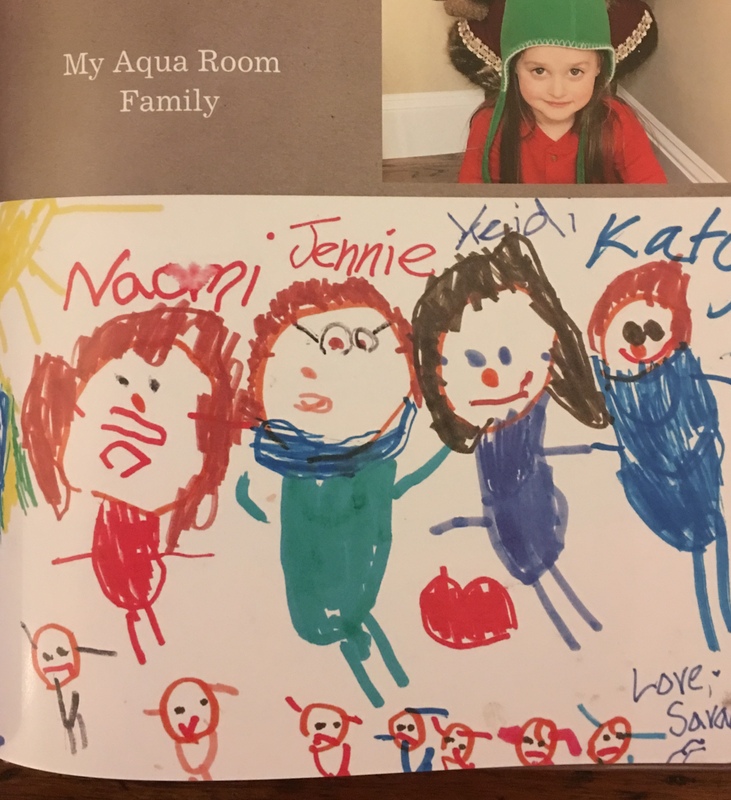 The following pages in the book were done by each child, drawing our Aqua Room family. Page after page depicted a child’s view of friends and teachers. That’s my class. The thread of being and doing (family) becomes who we are. 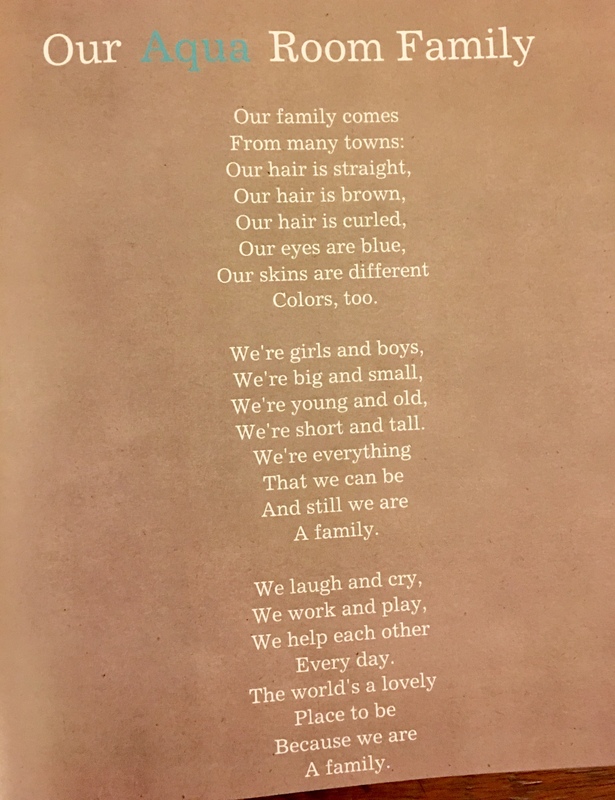 Children and teachers always talk about being a family, because we are. Thank goodness the parents know and understand that, and feel the same way. This entry was posted in books, children's books, Early Education, Family, storytelling, Teaching young children and tagged children's books, classroom environment, Early Education, emergent curriculum, Family, Giving thanks, listening to children, teaching young children. Bookmark the permalink. Congratulations, Jenny! You have a wonderful class. I will pass this post on to a teacher I know. Merry Christmas! Nothing short of brilliant Jennie.Always to be prized. What a wonderful gift to treasure forever. And the sentiments were so perfect too. You must be very proud for it is you that has created that family out of nothing. To go to so much trouble to present you with such a gift to cherish speaks volumes about the character of the parents whose children attend your class, Jennie. I can only imagine how moving it must have felt, to open such a treasure. It was moving. Tears came out instead of words. The children understood. Thank you, Pete. This is just so precious Jennie! What wonderful spirits you have stirred among your families – you are educating the whole family, and they have adopted you! Nothing better than heart ❤ to heart ❤ encounters which are those you bloom into blossoms while teaching the gentle, caring way you do, Jennie! An incredibly thoughtful gift to an incredibly dedicated and thoughtful teacher. Take a bow, Jennie for all the lives you change! Wow! What an endearing and enduring gift for a marvelous teacher, Jenny! If everyone felt this way, the world would be a better place. It really would, Dan. Thank you. This is so lovely and moving, Jennie. What a wonderful gift! When my parents divorced while I was at school – a rarity in those days – I was informed that I came from a ‘broken’ family. So I was very, very moved to see how you use that word family – because children like me – and my grandchildren – will no longer be singled out as somehow failing because our families fell outside the accepted norm. Thank you for your story. Yes, it was a rarity. I still vividly remember my friend whose parents divorced. What a shock. She was the ‘only’ child from a broken family. Schools and teachers were pretty stiff and formal back then, so I doubt she ever felt like she had a family. Friends, yes. 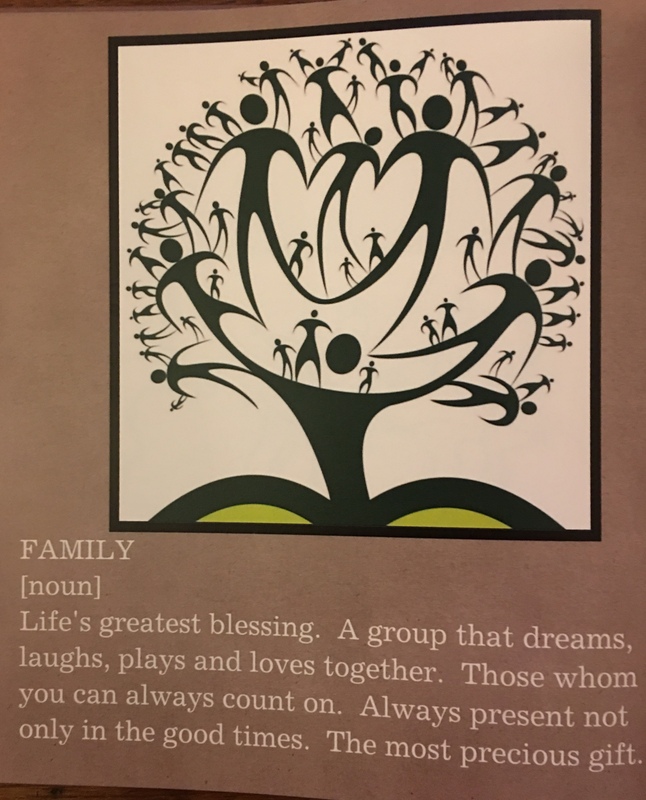 But not a family. And, thank you so much for your comments. If I can plant the seed of feeling accepted and part of a family, that is far more important than anything else. Your kind words are truly appreciated. Thank you! What a beautiful gift! That’s the sort of thing that is beyond gold or silver. I remember looking out at my first grade classroom, usually about a month after school started, and realizing we had gelled into a class. We had our own unique chemistry that grew as the year progressed. Yes! That’s exactly how it is. And, for the children it feels so good. A most wonderful gift for you, Jennie, a most deserving teacher. How spectacularly fantastical! I am so excited for you! For some reason, it reminds me of a ‘second grade teacher’ my kids had, who gave her mailing address at the end of the year and encouraged the kids to send her letters in the mail and she would write them back. Thank you, Ren. And, what a wonderful story of the 2nd grade teacher! Lovely, Jennie. We use the same language at our school as well. I liked the poem and the graphics in the book. What a wonderful, thoughtful gift for you to treasure! That’s wonderful to hear. You are on one great path to helping children. The rewards may not make you wealthy, but you will have a far richer and more rewarding career than most. Thank you for stopping by! I believe so, I can’t wait to begin it! You’re welcome! Love how the family has been described ! Great article ! Wow. I got choked up reading that…made me think of some of the sweet and funny cards and letters my kids would compose for me; several of them still adorn my refrigerator. Thank you for sharing that. My pleasure, Melanie. So glad you enjoyed it. Oh That was beautiful.Indeed being part of a family is exactly the spirit I always kept working on,in my classes too.Everything else falls in place then. Thank you, Sophie. And, you are so right!